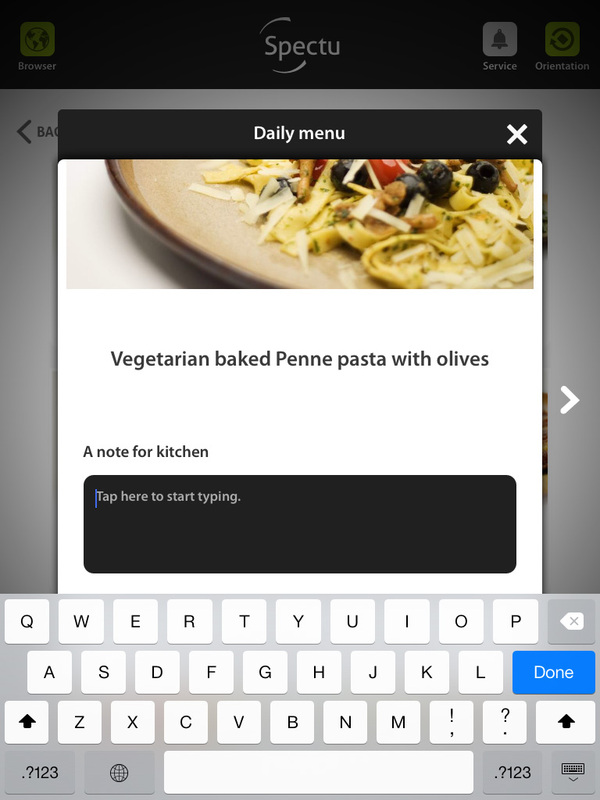 Spectu supports optional and forced modifiers, note, half portions and side dishes. 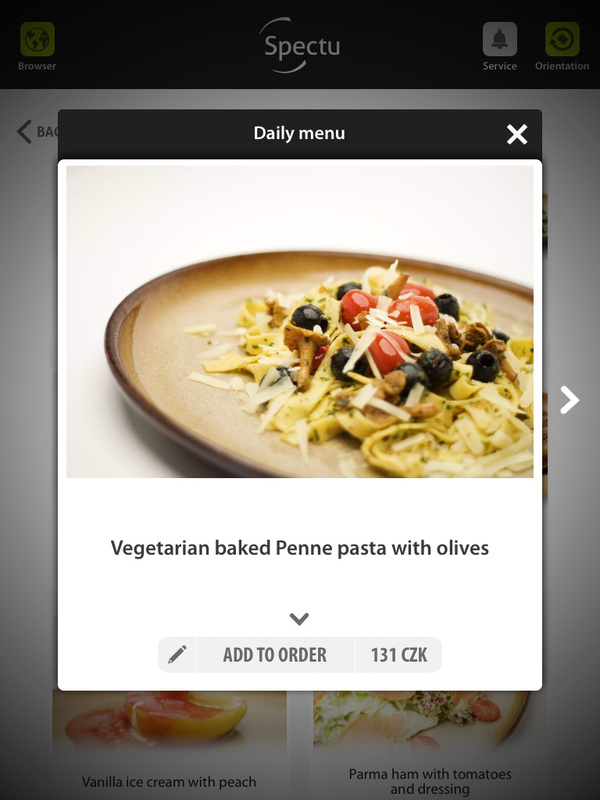 Thanks to this technology is menu easier for orientation and allow customers modify their order according to their taste. Modifiers are divided into forced and optional modifiers. Forced modifier may be used for method of preparing steak. If a customer order a steak, Spectu will automatically asks him how he wants to prepare meat and offers him options (rare, medium, well done, etc). Likewise forced modifier may used for volume of drinks (8 oz, 12 oz etc.). This setting allows you to reduce the number of items in the menu, because the beverages with various volumes will be include in one item. Optional modifiers are useful for sauces for example. 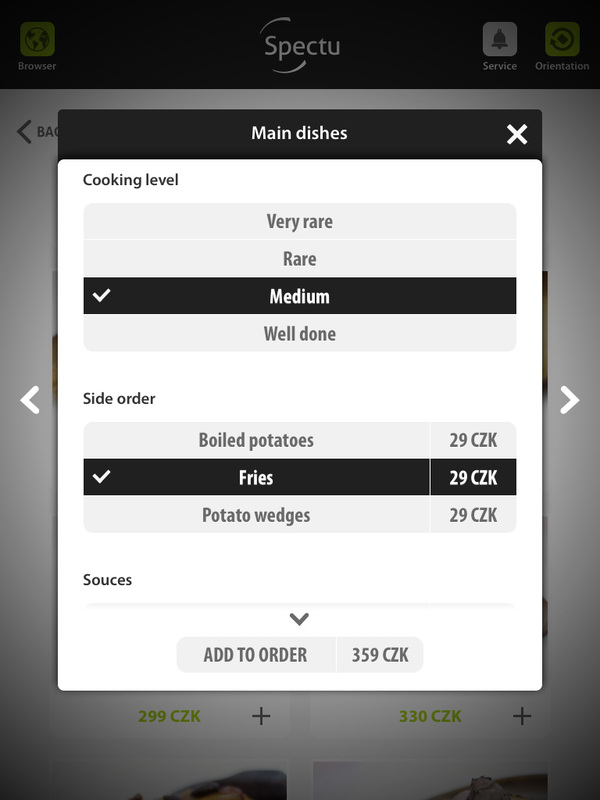 If a customer orders a burger, he can directly select the sauce type. Both modifiers types can be for free or for a price, than the price is shown next to its name. You can also set up, if customer can select one modifier only or more modifiers at once. 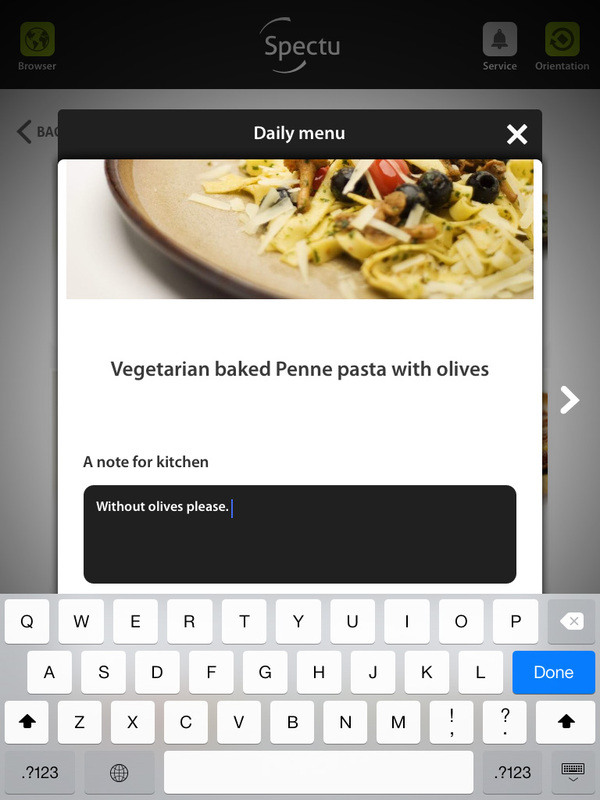 Another possibility for menu optimization are side dishes and notes. 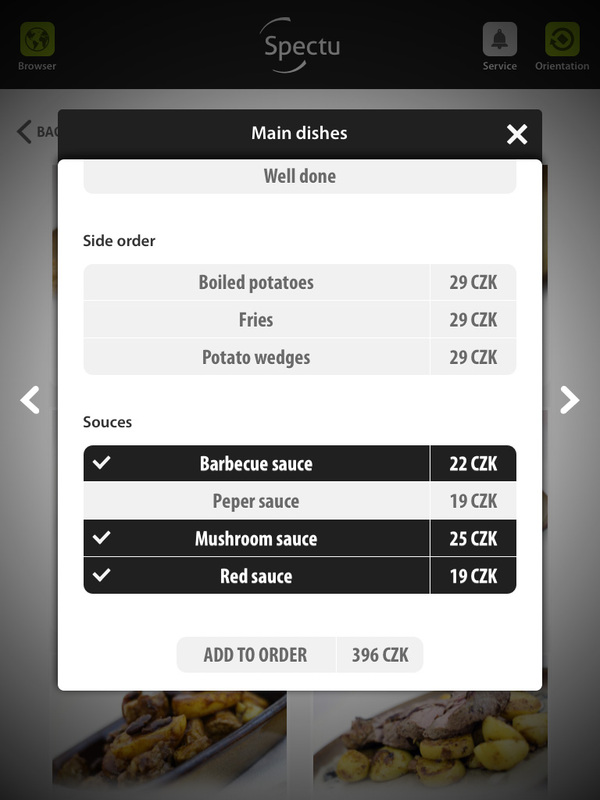 Side dishes allows you to offer the customer a side dishes with selected food and pair them on order. If the customer has a special request he can write a note. You can turn on and off this option for particular products. The next function is half portion. 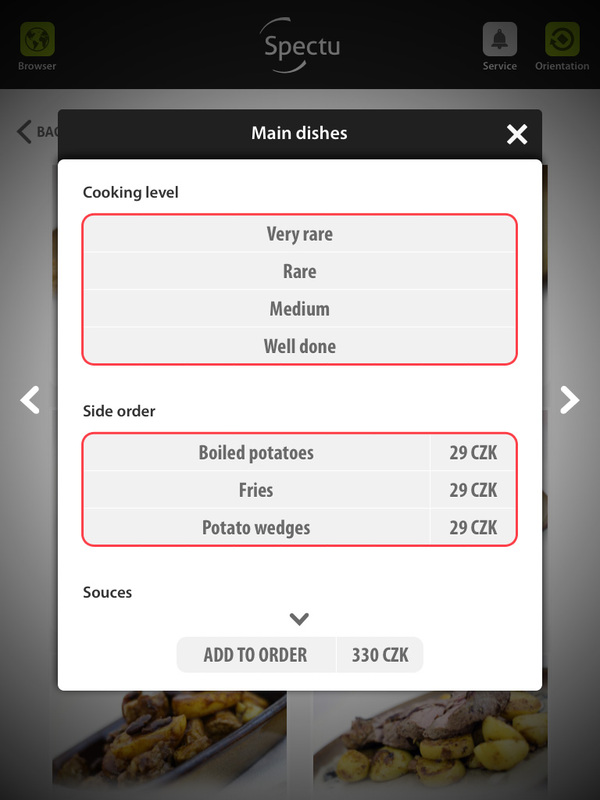 It allow you to pre-set parameters to offering your customers half portions of selected products. This feature is useful especially for customers with kids. Usually the setup is 1/7 price, 1/2 portion.